The tempo of music alters our behaviors – slower music encourages us to slow down and buy more drinks at a bar or spend more time in a grocery store, and familiar background music gives shoppers the impression that they spent longer in a store (though they actually spend more when novel music is played). Our musical attention span is about 4 minutes, thanks to Thomas Edison’s cylinder recordings, which maxed out at 4 minutes. Even when technology progressed to allow for longer songs, the 4-minute standard remained. When we’re deeply engrossed in something perceptual (like listening to music), the prefrontal cortex, which is crucial for introspecting and high-level cognition, becomes less active than usual, while the sensory cortex becomes more active than usual. These activation patterns likely explain the feeling of flow and timelessness that can occur while listening to music. In the second half of the post, Berger uses Schubert’s String Quintet to illustrate how “music hijacks our perception of time.” He describes the time warp going on in one section at a time, supporting each with a clip of the audio during the part of the piece he’s describing. This was a fun “audio tour.” I found that I had to close my eyes to be able to experience the time shifts, though. This could be for a number of reasons, but one interesting possibility is that when a sound clip is embedded in a web page, the bottom right corner of the clip counts down the seconds remaining. Maybe some people can ignore the steadily decreasing numbers, but I am just so drawn to anything marking time. Why might this matter? I’d guess that a large proportion of the music-listening that people do today happens through a computer-like device (iPod, phone, computer) that exposes the listener to a ticking clock. 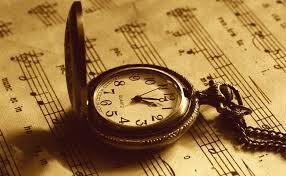 Do we experience less of this music-induced timelessness today than in the past as a result? Or maybe songs like Time of Our Lives could be to blame? Pingback: Here’s one effective way to communicate science | Whats in a brain?